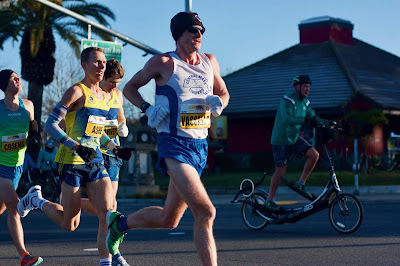 CMS Blogger - Congrats on the PR of 2:17:27 (5:15 pace), 31st overall at the California International Marathon (Sacramento, CA) on Sunday, a time of which met the Olympic Trials Qualifier (US Olympic Trials Marathon for Atlanta, 2020) with a sub 2:19. How did you feel going into the race (you ran the Baystate Marathon 2:29:08 on October 21) and can you provide some insight to your approach and plan for Sunday? Dan – I felt good going into the race. I had a good buildup that really didn’t have all that much adversity. No interruptions, no injuries, no especially long stretches of bad practices or bad races. I think I only had four bad workouts or races between August and December, and some of that was because I probably overdid it at Baystate and the few weeks before that. I keep a lot of detail in my training log, and I kept comparing my shape this year to when I ran 2:17 in Philadelphia four years ago. Based on the data I had, I knew I was in close to the same shape I was in when I ran Philadelphia. My game plan was to run a little quicker than “to the buzzer” of 2:19, but not to run recklessly in pursuit of a PR, because I didn’t think I was significantly fitter than I was when I ran 2:17. CMS Blogger – being that the race was also the USATF National Marathon Championship and USATF Pacific Association Marathon Championship, this was a competitive field. What kind of impact did that have on performances out there? Dan – At least in my pack, it was more cooperative than competitive, a level of cooperative I’ve never seen at a race before. The Sacramento Running Association provided incentives for every guy like me in the country – the guys straddling the line between pro and amateur – to show up and run fast. People responded to that incentive, because we were all there to do the same thing. There was only one enemy (the clock). People passed along water bottles, shared the pacesetting responsibilities, and worked together. CMS Blogger - there were a few competitors from the New England Region (Brian Harvey, Eric Ashe, Alex Taylor, Scott Leslie); what was it like to race them 3,000 miles away from Boston and did you talk it up with them? Dan – I wrote that it was comforting to have the four yellow jerseys right there with me. In New England (or in any event except for the marathon) it’s intimidating to race “against” those guys – I keep going back to when I was swallowed up by Harvey, Alex, and Chris Allen at Hartford this year. But they were familiar competitors who know what they’re doing, and I knew that as long as they were close by, I was where I needed to be. Didn’t see much of Scott, but he’s such a professional that I knew he knew what he was doing, too. Was not surprised at all to see him PR by so much. CMS Blogger – teammate Scott Leslie ran a PR by almost two minutes. I heard you guys had a “Presidential” workout run in Peabody a few weeks ago? Dan – Yes, there was a cold, rainy Saturday when we did sixteen laps around the Roosevelt, a one-mile, hilly loop in Peabody (elevation is on his Strava). I was honestly more nervous about this workout than I was about the race, and Scott was nice enough to come to my turf to join me. He hung for a good deal of the workout, and even after I put some distance on him, he kept me honest and inspired me to keep going when it would have been much more pleasant to stop. He finished within two minutes of me, in my big workout of the season, having never been on that loop before. I ran that workout faster than I had ever done it before, so it was afterwards where I was almost certain that was fit enough to qualify again. CMS Blogger – was there anything comical that came up during the race? Dan – There was a dude on a bike with a speaker, and he was playing music from the Rocky IV soundtrack. This was about eight miles into the race. It would have been a lot more helpful if he were eighteen miles into the race. CMS Blogger – was there any math going on in your head during the race to ensure you were tracking toward goal or were you locked in with the 5:15 pace all the way? Dan – Of course there was math going on. Especially the last eight miles, when I felt like I was just holding on and going “one more mile” to myself. “I can pull off doing the rest of the race at 5:30/mile and still get under 2:19. I can do the last two miles in 5:55 pace and still get under 2:19.” I knew I had enough in my tank to do that, so I was confident I’d be okay with two miles left. I wasn’t cognizant that I was still maintaining 5:15, though. CMS Blogger – bib # 62 and you placed 31st. Does either number represent anything in particular? Dan – I grew up right off of Rt. 62 in Wilmington, and I still do a lot of training on Rt. 62 between North Reading and Beverly. So that meant something. Thirty-first was good. You always want to beat where you’re seeded. Will try to do the same thing at the Trials. Below is a summary from Dan Vassallo following the race. Felt like nails on the warmup - primed to do exactly what I was supposed to do. Gun went off and found myself very comfortably in a huge pack. I was boxed in but didn't care except for the fact that I didn't want to roll an ankle on those little reflective things on the road. There were definitely a lot of downhills, but the uphills were still memorable, as it seemed that everyone in the pack tensed up and ran harder up the inclines. Hit 5k and 5 miles very comfortably, and what struck me as unusual was how cooperative everyone was - signaling before cutting in, sharing water bottles, and so-forth. Cannot definitely document what fluids I took in because many of them were passed water bottles. Throughout the race hit all the official water stops well whenever I wasn't boxed in. Keyed largely off of Harvey, Alex, Ashe, and Harper, and found myself with them, a guy wearing a "Pace Team" shirt, and a guy who was burping a lot and looked really uncomfortable. At seven miles, when some wiseass fan said we were almost there, I remember being much less pissed off than others in the pack. Minor stomach issues went away by ten miles. At ten miles, the pack splintered as three guys went ahead despite us being slightly under 2:18 pace. I was getting nervous at this point because the last 5K was slower than 5:15/mile, so I went with them - kinda. By not fully committing, I found myself in no man's land/frontrunning, but also prevented myself from running several consecutive 5:0Xes and putting the nail in my own coffin for the second half. Remember seeing Bob and Allie, Colin, and Emma Spencer out there yelling for us. Thought I did a decent job staying composed between halfway and 15 miles with a long, gradual hill, and between 15 and 18 I remained relaxed (I thought) while my body started to falter, but while others were certainly faltering more and I passed them to boost my own energy a bit, reminding myself that I'm not hurting the most of this field right now. I was taking Gu at normal intervals (13, 16, 19, 21, 24), and was no longer sharing anything. Saw an inflatable "The Wall" marker at twenty, and it really felt like that this time, but I knew that as long as I ran 34-flat for the last 10K I'd be able to make it to the Trials. Seemed reasonable, but the last eight miles of this race I was holding on for dear life. I guess that is part of doing the marathon: holding on while your body starts to fail you. Quads, calves, feet, arms, and finally engine. Was very spooked at 21 because I saw the shadows of like four guys coming up on me quickly, when I felt at my very worst. I prepared for this specter, remembering the four Africans in Philadelphia in 2014, and just didn't want it to be the same as Hartford with three BAA guys all blowing my doors off as I started jogging. None of them were my BAA friends, though. One guy was a Bowerman guy who was wearing squeaky shoes that looked like Shox, another was a wearing a Tracksmith jersey, and another was wearing a jersey like the Millennium guys. I was going to let them go because they sounded like they were running sub-5:10, but I was able to stay with them once I stopped front-running for a bit. Climbing the bridge was the worst part of this race, and I crossed it with them. I was on the left side, and right after the bridge I hit a pothole with my left foot, rolling my ankle to the point that I yelled. But what was I gonna do, step off with four and a half miles left? Continued calculating how slow I could close while still hitting the OTQ: 5:35, 5:40, 5:45, 5:55 at 24, but it never dawned on me that I was still running 5:15 pace and I had dropped three of the four guys in this new pack. Thought of Mindel at 40k, because marathon pace is easy when it's only 2 laps at a time. Calculated I could run the last 400m in 3:00 when I hit that point. Made it to the final stretch and shushed the haters, realizing I ran the exact same time as Philly. Was not especially sick afterwards, but legs were thrashed, and I earned it.